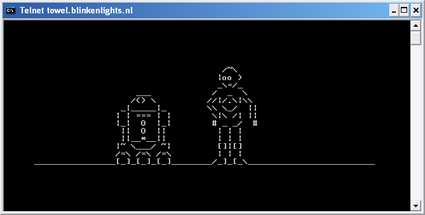 Watching Star Wars in ASCII text via telnet is probably one of the oldest tricks on the net. But not everybody may know about this “free television in your computer”. That is why today, I am going to show you how to watch Star Wars in text. Wait for it to load and enjoy! Star Wars should load after a few moments, sit back and relax! And for those of you who can still not get it working, you are in luck. You can use the browser website version here (click here).